We thought it was a perfect opportunity to meet a few people and look at some fantastic furniture, and that’s exactly what it turned out to be – making the 8 hour drive each way(!) very worthwhile. Saratoga Springs turned out to be a very pretty, quite upmarket little town and we thoroughly enjoyed our two days there. 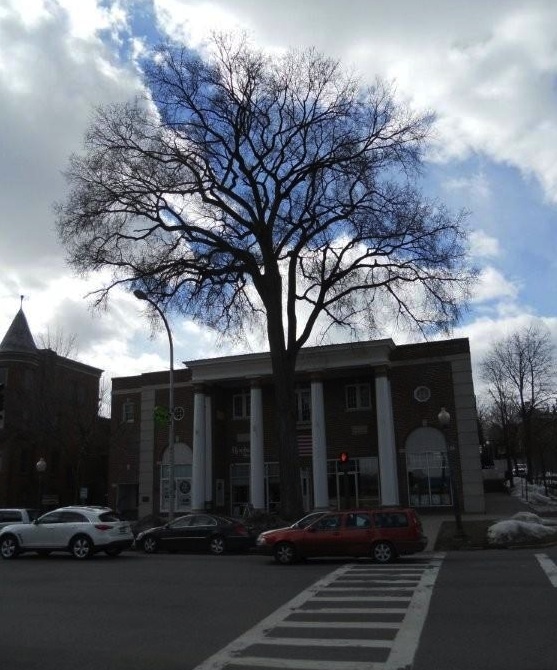 I was really taken by this magnificent and imposing elm, dominating a downtown sidewalk. The thing I enjoy most about these events are the live demos, and as always there was some real talent on display. For instance the Totally Turning symposium included top names such as Richard Raffan and Dale Nish. What an incredible selection of woodturning talent in one place at one time! The exhibits of superb woodturning included use of Pink Ivory, African Blackwood, Padauk and lots of other exotics from intricate almost ornamental turning to really chunky rustic stuff. In addition to that, the 20th anniversary feature exhibit was of 12 great workbenches (nine by NWA members and others by Lie-Nielsen, Christopher Schwarz and Geoffrey Noden). The respective owners gave short talks, and it was a great opportunity to discuss and consider design and construction options. See below for a selection of some of the pieces on display that I really like. You can see from the selection that I really like classic traditional designs. There was some truly wacky stuff out there too though – some people have incredible imaginations! All in all a thoroughly enjoyable little trip!